I didn’t have a parfait glass… so out came the martini glasses! Remember all that quinoa I cooked over the weekend? I put it to good use. “Very good use” said my 15 month old. Well, he didn’t really say that. But he gobbled down this Cinnamon Apple Quinoa Parfait in record time after his nap. 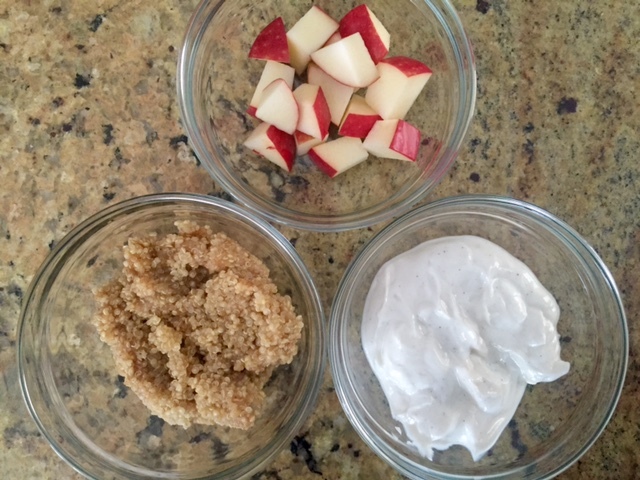 Rest assured quinoa, yogurt, and apple ended up on the floor. But he tried and ate some nonetheless. The best part about this quinoa parfait is that you can mix and match the fruit + yogurt pairing with any fruit and yogurt you have on hand! Dare I say another no recipe meal idea?! 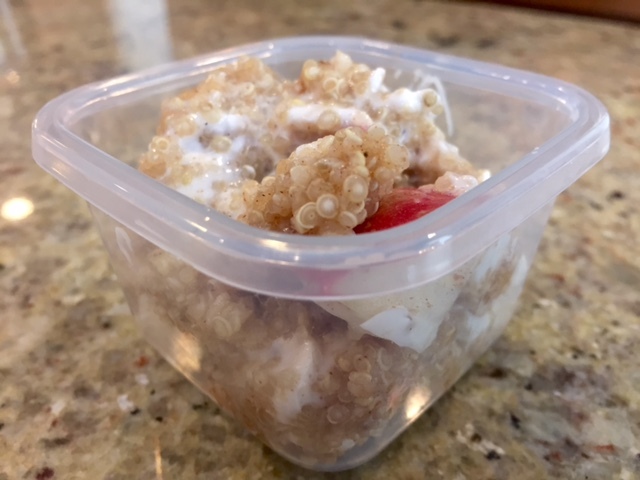 Cinnamon Apple Quinoa Parfaits for ENERGY! We always have these 3 ingredients on hand- so naturally they were the inspiration for this parfait! I also should mention that this recipe tastes just as good if you’re using granola instead of quinoa. But I challenge you to step outside of your tastebuds comfort zone and try something new! Plus, quinoa more often than not will have more protein that granola. How about them apples? Mix the quinoa, honey, and cinnamon in a bowl. 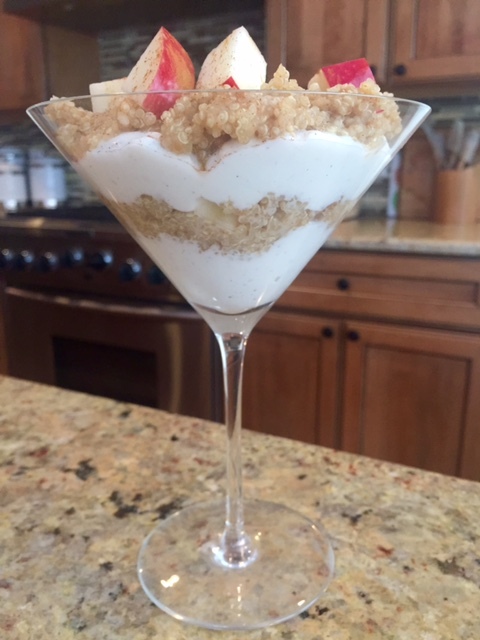 Assemble the parfaits by layering a ¼ cup of yogurt, ¼ cup of quinoa, and a ¼ cup of apple in a bowl. Repeat layers. Sprinkle with cinnamon before serving [optional]. If you were to make this quinoa parfait at home, what flavor combinations would you choose? I’ve never thought of trying a quinoa parfait! Looks so yummy! I should pass this on to my mom, we were just talking about ways to get fiber into breakfast without sugary cereals. I love this creative use of quinoa! Yes! It’s a nice swap for granola which tends to be sugary too! How did your parfait turn out Melissa?! I love using quinoa at breakfast time! Great idea! Mmm, what a great idea! Definitely never thought about quinoa for something like this, but can’t wait to try it! Pinning it too, thanks! Let me know how you like it Amanda! Quinoa is the perfect grain to make large batches of! You can use it at every meal and in every way! Exactly!! I think I’m slow to catch on to its versatility! What a great gluten free alternative for breakfast! So super simple and creative- love it! This sounds so great! I’ve been incorporating quinoa in a lot of different things, and I can’t wait to try this! Let me know how you like it Patricia!! This looks delish! I know my daughter would gobble it up too! I had a hard time getting my son to even try quinoa. Mix it with yogurt and he’s sold! This sounds delicious!! I going to attempt to make some dairy free yogurt this month, then I will be able to try out this recipe. Thanks for sharing this idea!